"Users praised the solid build, ease of use, and even toasting while they also loved the look." "It still has features that bring it a step above the basics." "It heats quickly, thanks to the 1800 watt preheat mode." "The brushed stainless steel exterior looks attractive while hiding fingerprints." "With no lever, this has a clean, attractive front." "Includes the ability to automatically keep your toast warm without further browning." "The unique integrated warming rack on this toaster hides out of view when you don’t need it." "You can toast pretty much any bread, from thick bagels to long slices of baguettes." 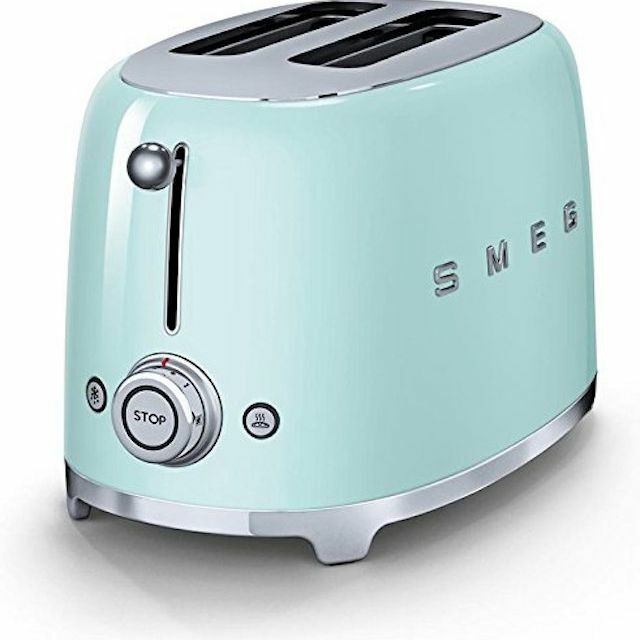 Smeg, an Italian company founded in the 1940s, has brought its unique designs and quality workmanship to the US market, including this attractive toaster that will stand out on your counter. Its retro look and unique color isn’t all you’ll love, though. Users praised the solid build, ease of use, and even toasting while they also loved the look. This has six toasting levels and you can choose a setting halfway between each to tweak the toasting to match your bread type, and it has reheat, defrost, and one-sided toasting for bagels and English muffins. The wide slots fit bagels easily and thin bread self-centers for easy toasting. The crumb tray is sturdy stainless steel, and the non-slip-feet keep it steady on the counter. While this does pop the toast up automatically, there’s no lift feature to raise the toast higher, so you may need wooden tongs to retrieve particularly short bread. See more reviews of our favorite toasters available for purchase. The price is right on this budget toaster, yet it still has features that bring it a step above the basics. The sides of the toaster are designed to stay cool to the touch, so there’s no worry about accidental burns, while the chrome exterior and colorful accents look attractive on the counter. The slots are wide enough for bagels, and operation is simple, which is great for homes with kids. Just turn the knob to set the toasting level, push the lever down, and wait for the toast to pop up. A cancel button lets you stop the toasting at any point, just in case it’s browning too quickly. You can use the level to lift the toast a bit higher, so it’s easier to grab when it’s done. This toaster oven does more than toast, so it’s worth the extra cost. Four quartz heating elements make sure the oven is heating evenly, no matter which setting you choose. When you’re in a hurry, it heats quickly, thanks to the 1800 watt preheat mode. A clearly labeled dial lets you choose bagels, toast, bake, broil, pizza, roast, cookies, and reheat, and you can adjust those settings for the perfect result. The “a bit more” button lets you continue cooking for just a little longer when the food isn’t quite as done as you like. This is a compact toaster, but can fit a pizza up to 11 inches in diameter, so you won’t need to heat up your large oven when your needs are small. The backlit LCD makes it easy to monitor the cooking process since it’s orange when the oven is preheating or cooking, and it turns blue when cooking is done. For easy cleaning, the interior of the oven has a nonstick surface. The top of this toaster oven gets hot during use, so you should avoid using it directly under cabinets. Want to take a look at some other options? See our guide to the best toaster ovens. This brand might not be a household name, but it has high praise from users. The design is simple, with a dial to choose the toasting settings from 1-6, and buttons to choose one-sided toasting for bagels and English muffins, a defrost setting, and a little extra toasting when you want slightly more browning. The brushed stainless steel exterior looks attractive while hiding fingerprints and backlit buttons look attractive when the toaster is in use. This is the future of toasters, with a lever-free design that lowers and lifts the toast automatically, and an audible alert lets you know when the toast is done. The LCD screen includes a countdown, so you can see at a glance how soon you’ll have toast to butter. With no lever, this has a clean, attractive front. Buttons let you choose one-sided toasting for bagels and English muffins, a defrost setting that first thaws your baked good before toasting, and a reheat option that warms the bread without further toasting. There are seven different shade settings, so your toast will always be perfect, whether you like a light golden brown or a darker brown. If your new style of bread browns too quickly, the cancel button saves your toast. The design is unmistakable, looking much like the nose section of a classic KitchenAid stand mixer, and the frosted pearl color is elegant and attractive. But it’s not all about looks. This toaster includes features that set it apart from the usual, including the ability to automatically keep your toast warm without further browning if you don’t retrieve it immediately. It can hold the toast for up to three minutes, so you’ve got plenty of time to finish the eggs. The bread lowers the bread automatically when bread is sensed, and it lifts automatically when the toast is done. Without a lever, the front controls looks cleaner and more attractive. There are seven toasting shades and options for one-sided toasting for bagels as well as settings for frozen bread and the ability to toast for a little longer when the toast isn’t quite done. Users have noted that this is a little slower at making toast, but it toasts much more evenly, so they don’t mind the slight wait. The unique integrated warming rack on this toaster hides out of view when you don’t need it, but when you push down on the lever at the back, the rack appears so you can reheat bread or pastries above the toaster, trying to make larger pastries fit into the slots, and without additional browning. Operation is simple, with a knob to select the toast shade from 1-7, and buttons to choose the defrost setting or to cancel the toasting. The brushed stainless steel body and black accents will look attractive in any kitchen, while the surface hides fingerprints. This unique toaster loads from the side rather than the top, so short bread will never be a problem to retrieve. Since this has one long, wide slot, you can toast pretty much any bread, from thick bagels to long slices of baguettes. The toast rack is completely removable and collects crumbs, so cleanup is simple, and the crumbs can’t hide. Just remove the rack to dispose of crumbs, and rinse it in the sink when it needs a more thorough cleaning. You can choose toasting settings from 1-6 using a simple knob, and buttons let you choose to defrost, reheat, and start. If you need to stop the toasting, you simply turn the knob to “off.” The toaster beeps when the time is up, and you can press the defrost button to add extra toasting time if your toast isn’t quite perfect. Interested in reading more reviews? Take a look at our selection of the best 4-slice toasters.